A French start-up has started introducing Giveh, one of the oldest and simplest kind of shoes Iranian know, to the world. Iranian people have heard its name a lot, but few are ready to wear Giveh. Hence, this type of Iranian handicraft is common in a few parts of Iran, especially in rural areas of Kermanshah Province. Many others, however, use it for decorative applications. A few years ago, the traditional rural shoes caught the attention of a French tourist visiting local markets across Iran. The tourist, a young girl, found the shoes soft, comfortable and durable and then came up with an idea to launch a start-up to sell them across Europe. The girl eventually put into action her idea a few months ago. She has helped revive a traditional craft in Iran and provide many Giveh-makers living in Iranian villages with a stable source of revenue. 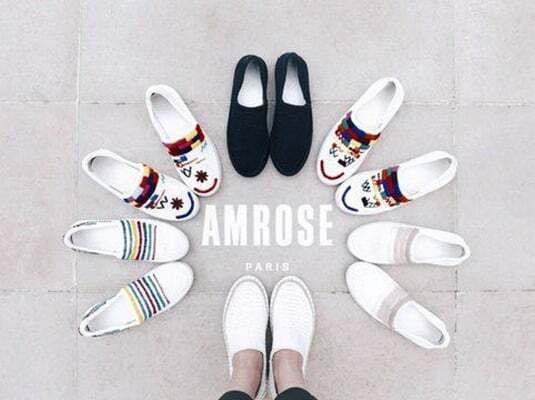 In an exclusive interview with the Persian-language newspaper Hamshahri, Oceane Castanet, the founder of the French start-up Amrose, recounted the story of launching her start-up. Castanet, who has been active in the fashion business for years, was amazed by the beauty of Giveh when she first saw it in Isfahan and Kurdistan provinces during her visit three years ago. “All the shoes I had seen before that were made of either leather or wood. I had never seen people weaving shoes. Giveh was a unique and handmade shoe I had never seen before,” she said. Castanet bought several pairs of Giveh and wore them all the time, even after returning to France. 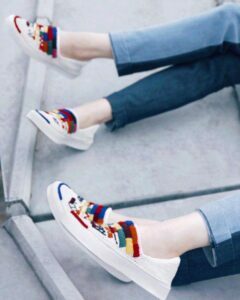 “I came up with an idea to launch a startup selling the shoes on the Internet. But many people underestimated the idea, saying Giveh is worn by villagers and foreigners won’t embrace it,” she said. Castanet’s friends in France thought the shoes were super nice, but they were a little too rustic for the city. However, one year ago, Castanet decided to abandon her previous career and dedicate herself to launching her Giveh start-up. Castanet introduced her project on crowd-funding Internet portal Kickstarter.com and managed to gain the trust of visitors and raise enough funds to start her start-up. Finally, Amrose started selling Giveh three months ago. Castanet tried to make the shoes appealing by creating a story for each set of them, besides emphasising on their major selling points, being handmade and unique. Each Giveh has its own design. There is also an identity card in the box of shoes containing their name, a painting and other things. “These are all attractive for costumers and create added value,” she said. Castanet supplies raw materials to female Giveh-makers in Kurdistan, Isfahan, Zahedan and Zanjan, and takes back the hand-woven shoes. In the next stage, the shoes are transferred to Portugal, where their fitting is finalized at a cheap cost comparing to other parts of Europe. “The total cost of production could be less if the shoes could be finalised inside Iran. But I’ve been unable to find such a workshop in Iran,” she said.